Cotton candy, clowns, and face painting had been on the mind of Rev. Barbara Schenk since she started serving Foster Memorial Church, UCC in Springfield. She thought it would be a nice idea to hold a small children's carnival on the front lawn, and plans were coming together this past summer for a carnival with a mission focus. Then the tornadoes hit. On June 1st tornado touchdowns were confirmed in a number of western Massachusetts communities, including Springfield. According to a boston.com news report, there were at least four deaths, 200 injuries, and tens of millions of dollars in damage to the area - including damage done to First Church of Monson Congregational, a Massachusetts Conference UCC church. That shifted Foster's focus to having the proceeds go to help with local efforts for tornado relief. On a warm Saturday in August, over seventy church members, along with extended family and friends helped run the festivities. There were games and activities for younger children, a bake sale, and refreshments of hamburgers, hot dogs, beverages, popcorn, sno-cones and cotton candy for purchase. Tickets were $5.00 per child and activities included ring toss, face painting, arts and crafts, bubble table, bingo, photo cutout boards, and other child-friendly games. Each child received a miniature tote bag for prizes they won, and every child won a prize for every game they played. The prizes were small so the ticket price per child could be kept at an affordable rate. "It was fun to watch the children dump their bags on the ground and look at their prizes," said Schenk. "It reminded us of Halloween night after trick or treating!" It was a real community effort. The mayor attended, members of the fire department brought firefighter uniforms for the children to try on, and the police officer let the children set off the police cruiser siren. Church member Jim Cummings was able to find a clown, magicians and a DJ who were willing to donate their time. At Jim's request, local businesses donated tables and tents, as well as popcorn, sno-cone and cotton candy machines. 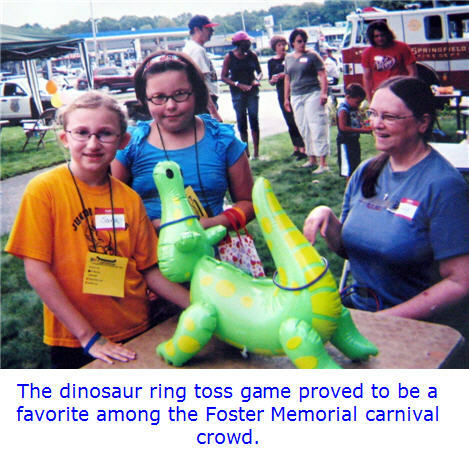 "Children got to experience the old-fashioned games and food that hallmarks a carnival," said Charlene Corris, a church member who was very involved with the planning. "Our bubble table was overflowing with toddlers, while the older children played ring toss, went digging for dinosaur eggs, and had their faces painted. The ever present smiles told us they enjoyed themselves." The church did as much publicity as possible, promoting fun for the whole family, and the community responded. The over $1600 raised is earmarked to go to meet unmet needs of tornado survivors through the Springfield Community Together Long Term Recovery Group. The event brought back good memories for church folks of other events held on the church lawn in years past. "After such a life changing event such as the tornado that Springfield residents experienced, it was so joyful to see families come together and share fun and contribute to the tornado relief fund," said Corris. "It was such a privilege to be a part of this happy time." "It is a true blessing for me to serve this church, where people are so willing to put faith into action"," wrote Schenk in her website pastoral letter. "I feel grateful, truly grateful that together, we can reach out in Christian love and care to help our neighbors." Rev. Barbara Schenk can be reached at the church office at (413) 782-2112 or fostermemorial@msn.com. In addition to her pastorate at Foster Memorial, Schenk has recently been named the new pastoral visitor for the Western Region working closely and collaboratively with Associate Conference Ministers Jill Graham and Peter Wells to provide visitation and consultation with local pastors in the region.